This interesting early regional map by Sebastien Munster is oriented to the south, and is centered on Dalmatia and the Adriatic Coast, from Trieste to Sara (now Zadar, Croatia). Both Trieste and Zadar have played important roles throughout history as they both are strategically located on the Adriatic, with signs of human habitation in both cities dating far back into prehistoric times. Many other cities and towns of various sizes and importance are depicted, along with other topographical features including mountains and rivers. In Roman times the city now called Trieste flourished due to its position on the road from Aquileia, the main Roman city in the area, to Istria, and as a port, some ruins of which are still visible. Defensive walls were constructed around the city by Emperor Augustus in 33–32 BC, and Trajan built a theatre in the 2nd century. The city has flourished under myriad regimes to modern times. The city called Sara by Munster and now known as Zadar was already a Roman colony by 48 BC. Under Roman rule the city acquired the characteristics of a traditional ancient Roman city, including a forum and a temple built on elevated ground. During the seventh century Zadar was made a regional Byzantine capital. Today, Zadar is a historical center of Dalmatia, Zadar County's principal political, cultural, commercial, industrial, educational, and transportation center. 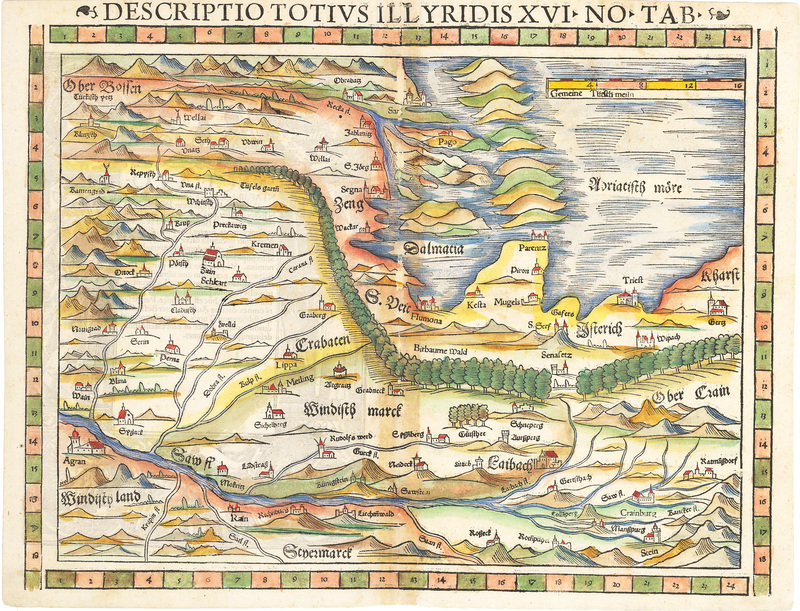 This map is from the 1552 Latin edition of Munster’s Cosmography, one of the most influential geographical works of the sixteenth century. Condition: This hand colored map is in B condition due to loss of paper at the centerfold, which has been repaired with archival material on the verso.